(Newser) – Ready or not, 3D TV is coming this year, with every major television manufacturer planning to unveil a 3D set at today's Consumer Electronics Show. DirecTV is also expected to announce some 3D channel offerings on the heels of yesterday’s announcement that ESPN plans to launch a 3D network during the World Cup. 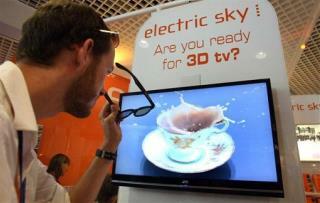 “The stars are aligning to make 2010 the launch year of 3D,” an LG vice president tells the New York Times. Exactly. But they won't...because 3D is just a gimmick and would be awesomely cool and cutting edge.....................................in 1984.